Lock picks are when its a 100 percent the pick and no other teams have a chance. Predictions in bold are Locks. Time and time again Thibodeaux has proved why he is the best player in the country in 2019. He is relentless, a born leader, and guaranteed to make an impact the minute he steps on your field. At 6-5 240 the top prospect in California has the speed to chase down any offensive player on the field. He is a nightmare to quarterbacks and an animal when hunting down the ball carrier. 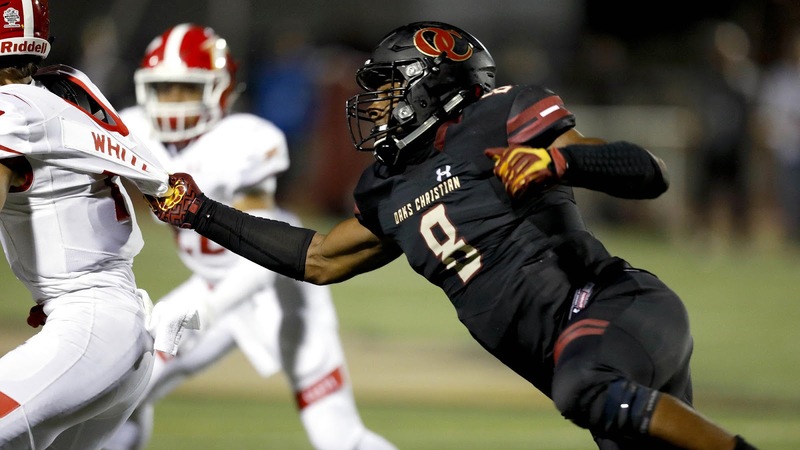 Thibodeaux plays for Oak Christian high school in Thousand Oaks, California. He is the number one overall player in the country for the 2019 football recruiting class By ESPN, 247 sports and NFL draft room but is considered the number 5 player in the nation by Rivals and the top defensive end by all four sources. This season for Oak Christian Thibodeaux had 44 total tackles and 18 sacks causing 5 fumbles and blocking 2 field goals. He has natural gifts that make him a special player on the football field. Look to see Thibodeaux making an impact on a NFL roster in the future. All Rights Reserved by NFL Draft Room. Awesome Inc. theme. Powered by Blogger.